The state government of Tamil Nadu has announced the launch of first of its kind scheme in the state. Under the new scheme the state government will be distributing set top box for free to the people of the state. The state government has announced to run the scheme for the subscribers “free of cost” initial charges. Under the new scheme it is certain that the Subscribers can get a chance to enjoy entertainment for an affordable monthly cost. The government has also announced that the Digital signal will be transmitted by Arasu cable TV Corporation LTD. According to the sources it is certain that the state government aims to provide the subscribers with set top boxes with a period of three months. The subscribers will also be able to enjoy high quality picture and sound via DAS (Digital Addressable System). The government has also issued a set budget for the entire project along with the release of the work order for the same. The state government has also approached all local cable operators to help distribute the set top box to the subscribers. To make it more effective the state government has announced to set up a control center in Chennai to regulate and monitor the distribution process. The subscribers would also be provided with affordable one time registration along with maintenance just for Rs 200. With the launch of the new scheme it is certain that the state government aims at targeting over 70.52 lakh subscribers who are already connected to Television network via cable operators. Once implemented it is certain that the state government shall be able to generate over 233.67 crore Rupee as Over all profit this year for 2016-17. For better implementation of the service and quality the state government also launched an upgraded control centre for MPEG4 services that shall be transmitting digital signal to the subscribers. The subscribers will be able to enjoy for different packages offered by the service provider – Starting from Package 1 to Package 4. Package 1 – Under this package subscribers will be able to enjoy 22 paid channels along with 158 channels for free at the rate of Rs 125 monthly fee. Package 2 – Subscribers will be able to enjoy 158 Free channels along with 72 paid channels just for Rs 175 for monthly subscription fee. Package 3 – Under this subscription it is certain that Subscribers will be offered with around 158 and 102 free and paid channels just by paying Rs 225 as subscription charges for one month. Package 4 – Under this package it is certain that subscribers will be offered with over 158 free channels along with 142 paid channels just by paying monthly subscription fee of Rs 275. The government has also made it clear that the subscribers will have to pay over 18 percent GST as applicable. 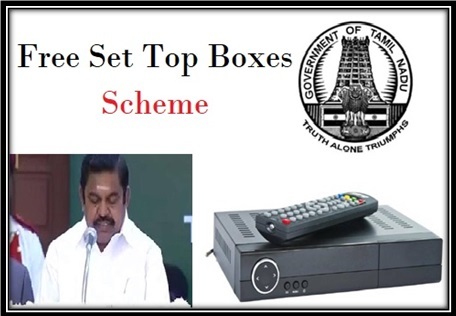 In a bid to offer digital entertainment to common people of Tamil Nadu, Arasu Cable TV agency has already started distribution of free set top boxes. This scheme will pave the path for new age digital entertainment broadcast. All interested applicants will be able to get this free set top box by offline application. It is not compulsory for all. If anyone wants to get free set top boxes, they need to reach out to their local cable service providers. Customers must collect an application form from these offices. Applicants need to fill in these forms with their details. They must also attach Aadhar card photocopy, and address proof documents. All application forms must be submitted before 31st Aug. The enrollment forms will then be checked, and these households will be offered free digital set top boxes for better entertainment. It is certain that with the launch of the new scheme in the state The TN government aims at starting a new initiative in the field of entertainment for the local people. The state owned cable TV service can be enjoyed by the subscribers for an affordable monthly charge along with digital quality picture and sound. Most people in Tamil Nadu still have analogue set top boxes. Local cable operators implemented the Free Set Top Box scheme in 2017. Under this scheme, cable operators will charge only for monthly subscription. It will be the responsibility of cable operators to meet up with interested candidates, and attain their details.